Bad, or blocked fuel injectors are not uncommon. If you own a fuel injected Harley Davidson that begins running on only one cylinder, this may be the case. Running on one cylinder, however, can be caused by a number of other issues that will need to be ruled out first. Recently, we had this 2008 XL in the shop. The customer explained that it seemed to have a loss of power and was running “rough”. 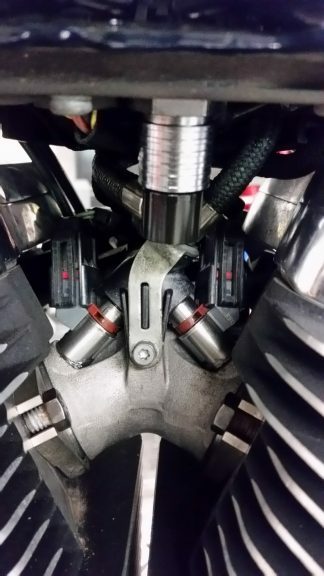 We quickly determined the m/c to be running only on the front cylinder. This, because of the simple fact that; the exhaust emitted from the front cylinder was hot. The exhaust from the rear was only warm. Mostly common sense. Next, we wanted to determine if the issue was electrical or fuel related. The quickest and easiest thing to do is to check for possible stored diagnostic trouble codes. Often times, a stored code can either lead you directly to an accurate diagnosis or, at least, give you some type of clue that can lead you in a logical direction. This time, however, the m/c did not have any stored codes. Next we decided to use a spark tester to check for spark at the rear plug. We found plenty of spark and were now able to confidently determine our issue to be fuel related. A fuel pressure test showed us a good, constant 60 pounds of pressure being delivered to our injectors. We could now determine that the rear injector on the XL was inoperative. At this point, you might need to think electrical again; but when turning on the ignition and switching to “run”, we could physically feel the injector functioning. No need for the electrical manual today. We took it one step further. We wet the injector and manually pulse powered it on the bench above a plain piece of paper. No fuel to be seen. There are a number of high quality injectors available for Harley-Davidsons. 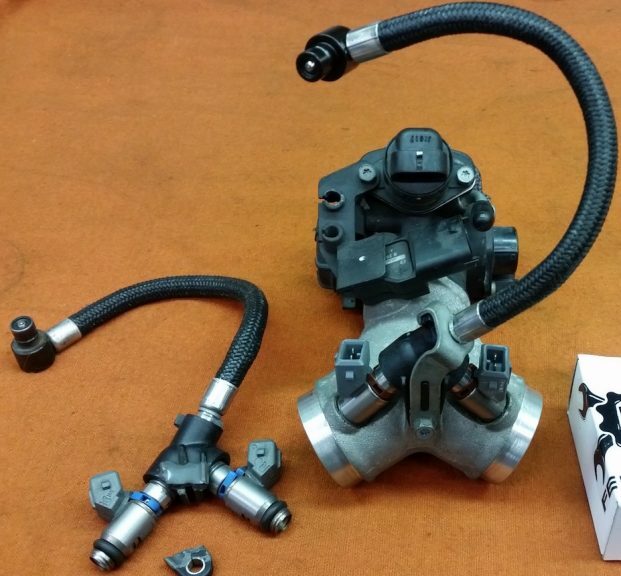 This time, our customer requested that we install Fueling injectors. Injectors should always be replaced in pairs. We also replaced the fuel rail (with the correct OEM replacement), intake seals and spark plugs. WHAT IF THERES NO POWER TO ONE INJECTOR ? Was. 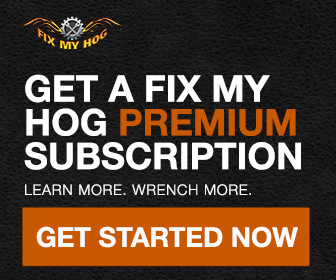 It necessary to replace the intake manifold? Help! I have an 02 Roadking screaming eagle fuel injected with 45k. I own 42,000 of those miles. Soon after I bought it it developed a skip. I’ve had about 5 different mechanics look at it which included 2 different Harley shops. I have spent thousands over the last 10 years trying to have this corrected. Does anyone have an idea or point me to someone in Ct. that can trouble shoot and not just change parts? I’ve been told it’s the way I ride, occasionally (but only occasionally the bike runs great so I know it’s not me. I can’t believe with millions of HD’s on the road I can’t find someone’s who can fix it. What if injector is good but won’t work when plugged in? How to rewire injector if wire is bad? Thank you for contacting us. That sounds like a great question for our experts! However, they will need to know your year and model to answer your question correctly. Please respond with your year and model and any other additional questions you may have. I have no front cylinder injector is good getting no signal fro ecm to injector. How do I repair this can’t find a brake in wiring anywhere. It’s important that you closely inspect the injector sockets at the end of each wire. Sometimes this could be the weak link. Use a volt meter and see if you have continuity from any point in the wire, to the end at the socket. From there, if the electrical issue is with only one injector, and you are certain that there is no wire damage, the issue is within the ECM.